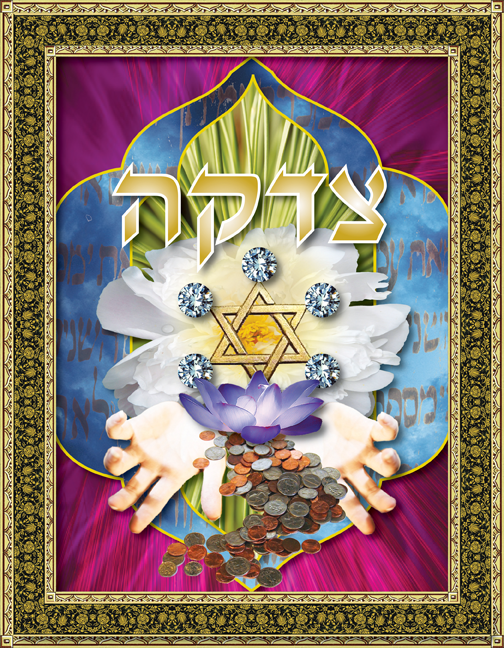 Pillars of Judaism :: "The Gift of Giving"
The English translation of the Hebrew word “tzedakah” is “charity”. This art piece examines this word and explores the spiritual impetus for the sacred act of generous giving. The vibrant and undulating waves of the magenta background serve as a window to the cerulean blue sky. Floating over the clouds are words from the Torah, representing the request from G-d to fulfill the mitzvah (good-deed) of charitable giving. In the center of the image is a smaller window depicting the lush green vegetation that is the bounty given to us by our Creator. From that, a large white peony, the symbolic flower of purity and compassion, bursts forth. 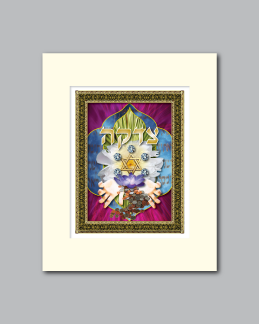 Within the heart of the lovely bloom is a golden Mogen David (Star of David) surrounded on each point by a magnificent diamond. 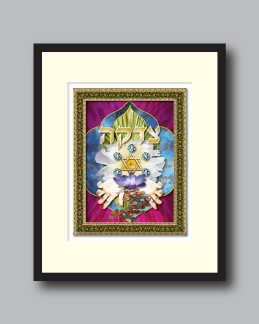 Just below the Mogen David is a blue lotus, representing spiritual awareness. This magnificent flower delicately rests in the open hands that appear to be offering a cascade of coins to all people in need. Together, these images symbolize the very essence of true giving and generosity of spirit.